This awesome LNQC banner was created by my talented brother Steven. 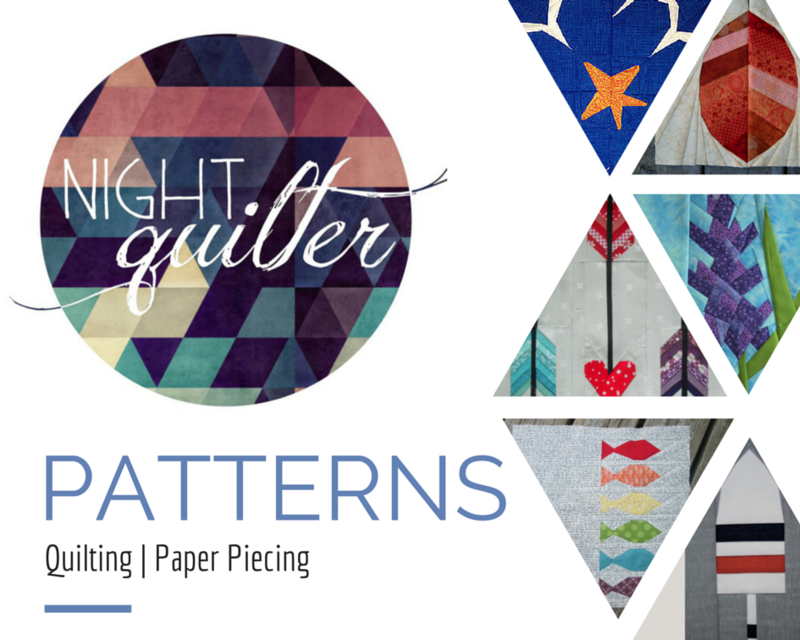 About a week ago, my new quilting friend Stephanie and her local quilter friend Michelle and I decided to launch a new Facebook community for fellow late night quilters, since we were getting so much out of our own nightly conversations. It started as a page, but the interest and content was so fabulous after only a day, that when new members requested that we make it a private group, we knew it was the right path. This way, it allows for easier communication and better sharing of pictures and ideas. Facebook “pages” aren’t as conducive to posts by many different people in a community as “groups” are. So we made the change, and the group is hoppin’! We want you to join us there. Your posts will be front and center so you can get lots of feedback from fellow quilters. You can network, ask questions, share advice, share your own works in progress, or even just be a wallflower looking for inspiration. How is this a work in progress, you may ask? Well, we have a lot of great ideas still in the works, including the creation of a button you can include on your blog, creating a weekly fabric swap so that you can buy, sell, and trade fabric on the page, and more! If you’re on Facebook, would you please give us a little love and take a second to join the group (Steph, Michelle and I are accepting requests as fast as we can), share it with your quilting friends, and perhaps post some of your projects? We’d all love to see what YOU’re working on! 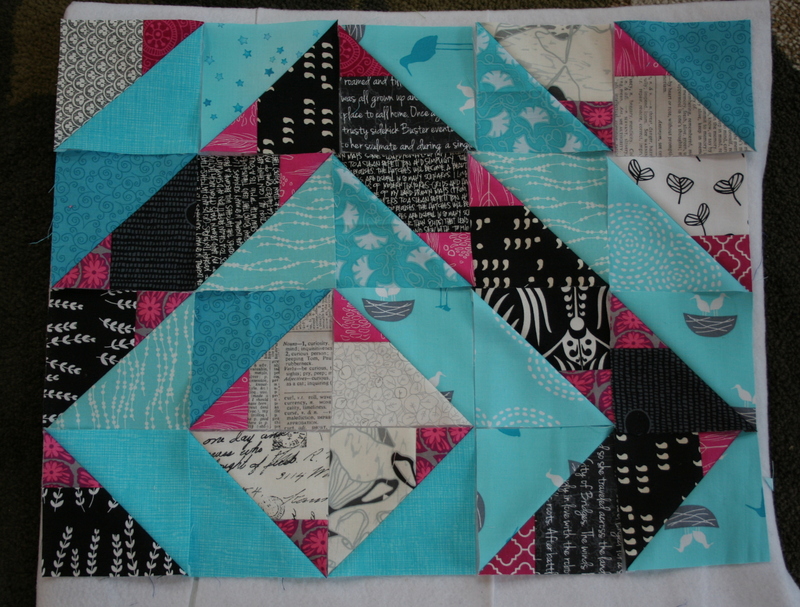 I have completed my first block for the Supernova Friendship Block Swap, and I love it! I still need to make a duplicate for myself, but I figured I may as well stay ahead and start writing my first letter to my partner Laura. The aspect of the swap that really drew me in at the start is the friendship-making in the process. Each month, I will send not only an awesome 18″ supernova quilt block to Laura, but I’ll also write her a letter about myself. 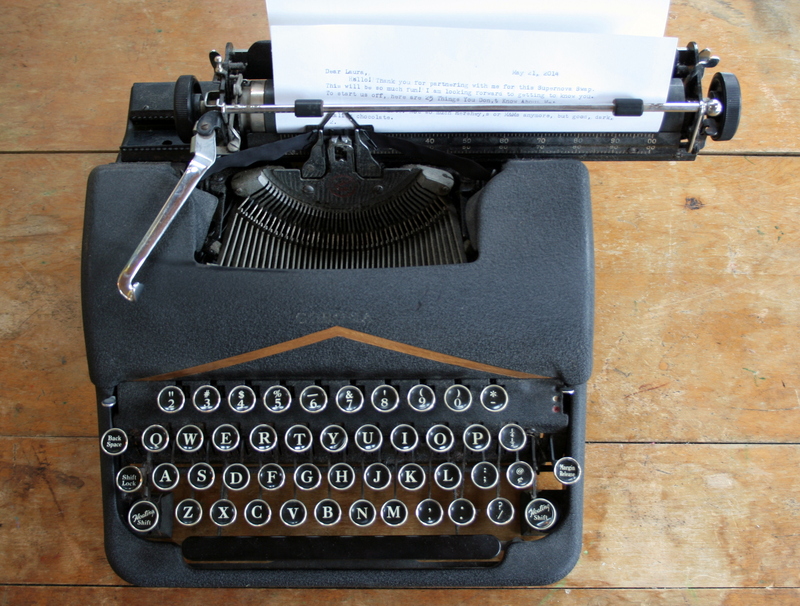 I’ve decided to type most of the letters since I have an awesome typewriter and may as well use it. 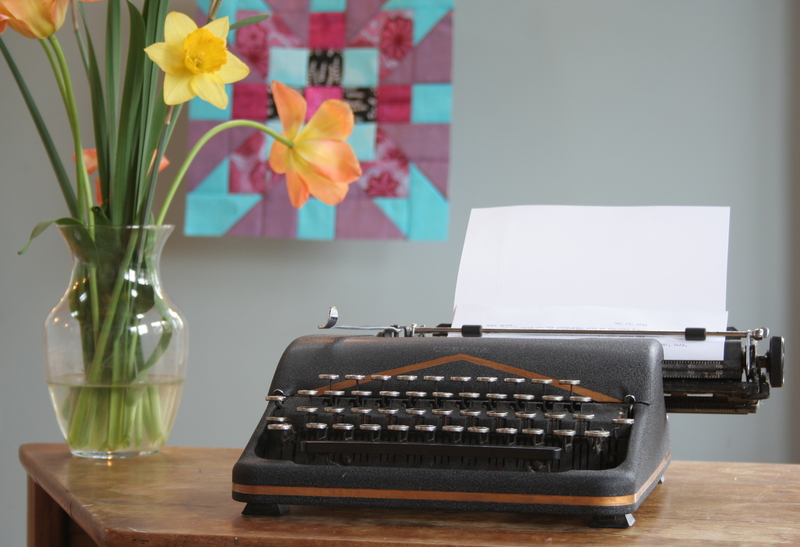 Besides, how awesome would it be to receive a typed letter in the mail?! I hope Laura agrees. I think that the swap is partially supposed to be a surprise each month, and I’ve already blown the surprise this month anyway with my tweeting and Instagramming, so I figure a semi-secretive peek at my block is okay. In future months, I promise to only post pictures AFTER Laura has received her blocks! This is going to be fun! My final work in progress has been a fun little “extra”. My Star Crazy quilt is the first pattern I’ve used that results in many, somewhat large, already cool-looking scraps. 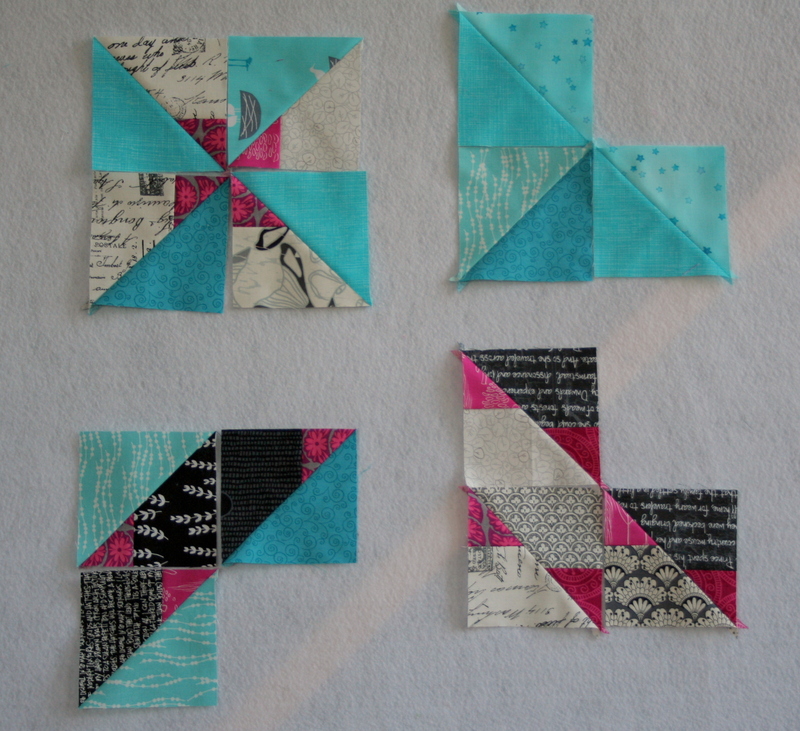 I have been having a lot of fun playing around with different possibilities for the scraps. I think I have decided to make them into a set of place mats, but I think I will wait until the quilt is finished to make sure I have enough pieces to make a sufficient number of coordinating place mats. The alternative, of course is to use them on the back of the quilt. Either way, it has been fun discovering all of the wonderful arrangements possible with half-square triangles (HST). What do you do with your HST scraps? Do you have a favorite arrangement? I’m linking up to Work in Progress Wednesday over at Freshly Pieced.